It’s funny because even though I’m conscious of these posts going out into the world, I still kind of sort of treat them a little like a personal journal. Sure, I mean, I’m not completely open about everything, but that’s because I don’t think people would be interested in the fact that I painted my toenails hot pink yesterday. Ugh, funny-not-funny story though: my left foot stepped on my right while the polish was still wet and then I stepped on the floor, leaving a tiny hot pink spot behind. I did what I thought was natural – that is, I used some nail polish remover to take the polish off and um, oops, let it be known that you’re not supposed to use acetone to clean hardwood floors. Luckily it’s just a tiny spot and I think (I hope!) no one will notice. Rambling aside, isn’t the internet a funny thing? Just the other day Mike and I were discussing how people born today will have essentially their whole lives documented on the internet. Parents put up photos of their kids and 2 year olds know how to play iPhone games better than I do. All this has nothing to do with tofu fries, so let’s just talk about those for a second. Deep-fried tofu is amazing. Even shallow, pan-fried tofu is amazing. If you love texture contrasts, this is a dish for you. The crusty, crunchy outsides give way to a soft, yielding creamy soft centre. Toss those crispy guys up with sesame honey garlic sauce and a drizzle of sriracha and you’re got yourself an indulgent snack. So good. 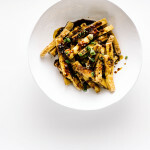 PS – If you like this recipe, I’ve got another tofu fries recipe in my book, Easy Gourmet. I hope you check it out! 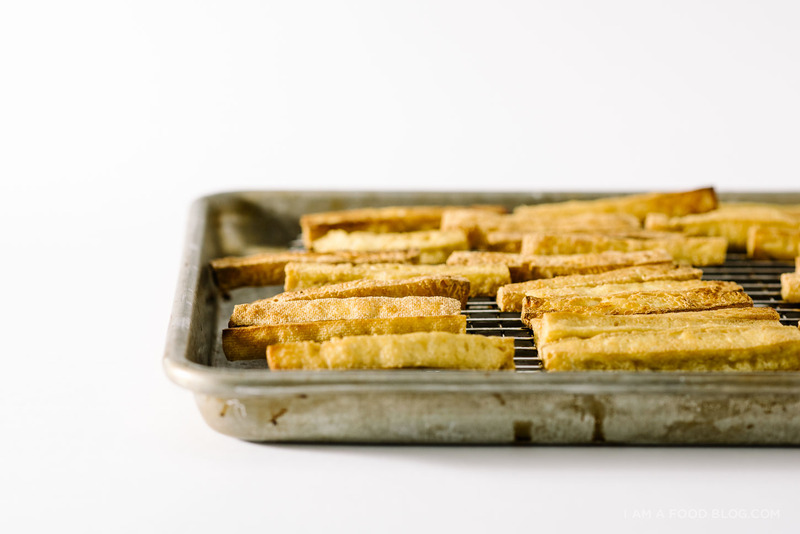 Cut tofu into fry shapes. I usually cut the block in half, and then each half into four, which will give you 8 slabs of tofu. Then I cut each slab equally into 4. You end up with 32 sticks of tofu. Let the sticks drain on paper towels for 10-15 minutes, switching out the paper towels once or twice. While the tofu is draining, make the sauce. Heat up the garlic, honey, soy sauce, vinegar, and water in a small sauce pan. Bring up to a gentle simmer and reduce slightly. Taste and adjust flavors if needed. Keep warm on very low heat. Heat up a generous amount of oil in a non-stick pan or a heavy bottomed cast iron pan. 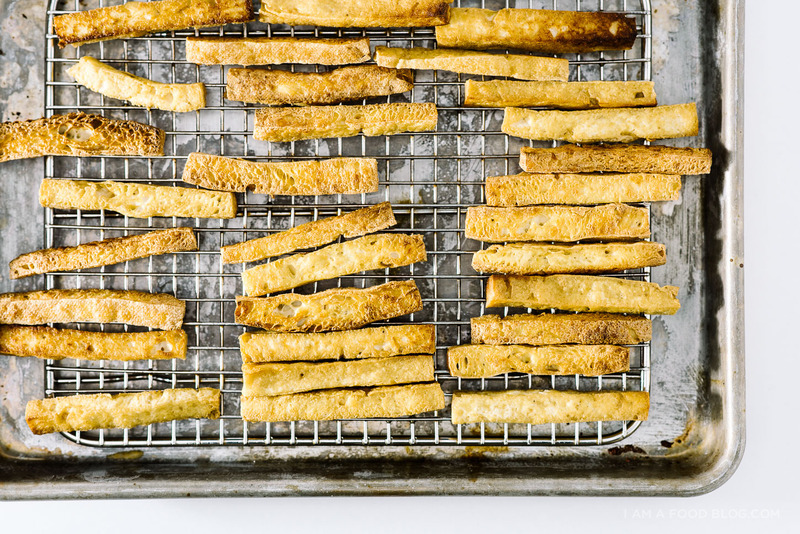 In batches, fry the sticks over medium to medium-high heat, flipping so all sides fry up, until golden brown and crunchy, about 10-15 minutes total. Let drain on a wire rack or paper towels. 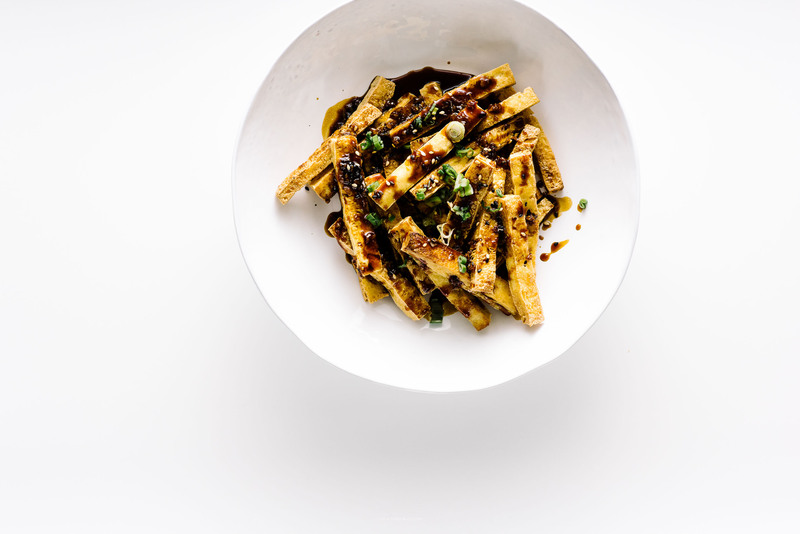 Throw the fries into a bowl and drizzle on the sauce and sriracha (if using) to taste. Enjoy hot! TOFU FRIES!?!?!! I WANT THEM ALL. Also, rub a little oil on that bare spot on the floor and you should be good to go. These remind me of your garlic honey tofu bites, which I made a couple nights ago and devoured with rice and seasoned nori. These sound just as delicious, and I can’t wait to try them! Well, for me, I’m glad you mentioned your nail polish incident because it reminded me that I wanted to paint my nails today and every other day for the past two weeks but keep forgetting. So, thanks for that! And I’m sure no one will notice. Tofu fries?! Such a cool idea, and that honey garlic sauce is right up my alley. I google people more than I should probably admit. Oh, the internet. 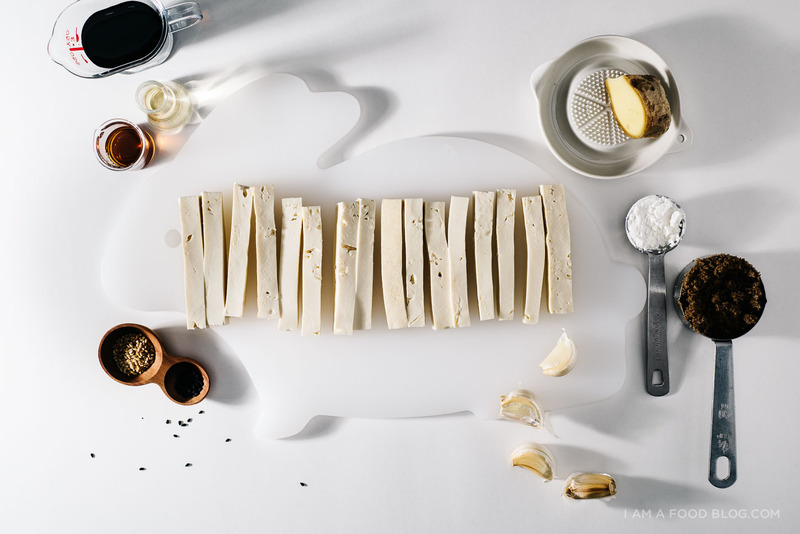 I am always looking for more ways to use tofu, and this one looks awesome. Do you find that it matters what kind of oil you use? I usually have coconut oil, olive oil, and sesame oil around. I usually use a really neutral oil to fry things – sunflower, safflower, grapeseed, rice bran, or good ol’ canola. I fry for very few people, Steph — but I will always whip out the skillet for you. Always. These look amaze! THESE FRIES. OMG. You never cease to amaze me, Steph!!!! Oh my gosh, these look so, so, so so good. 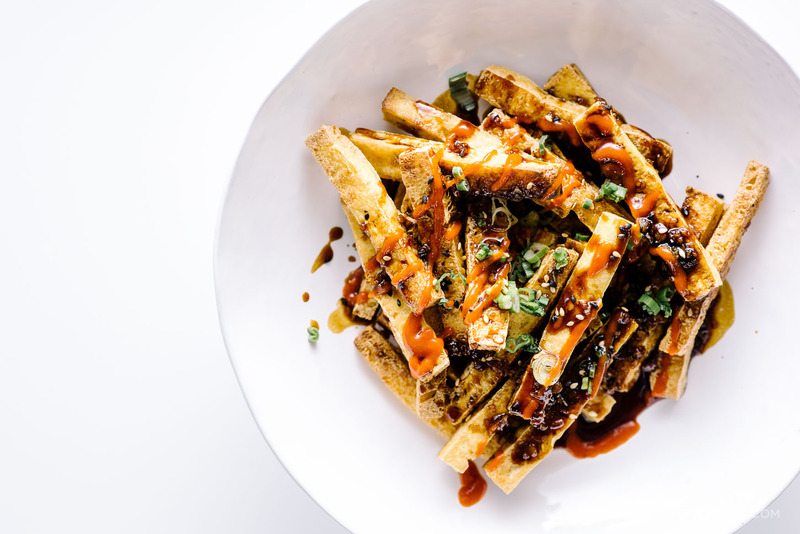 Tofu cut into fries for maximum crispness, sugar, soy sauce, sesame, sriracha = be still my heart. I love this. 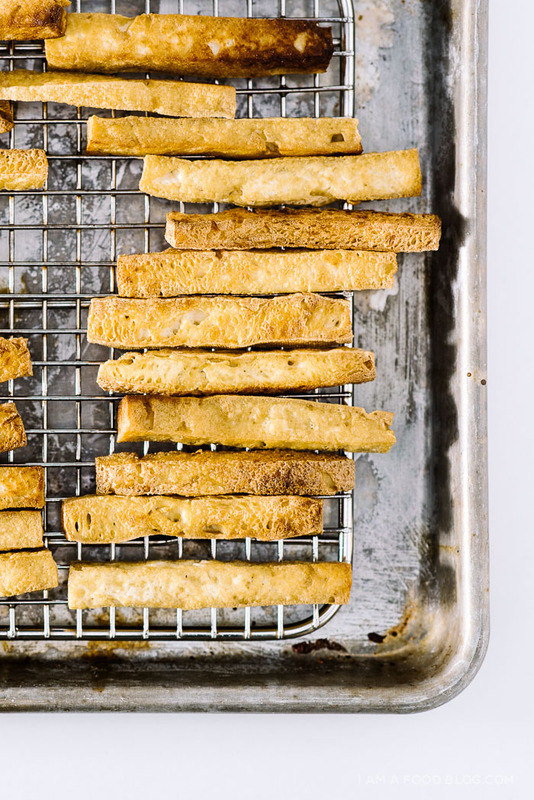 Either I’m weird for never seeing tofu fries before, or you’re a genius, Probably both. I totally agree with you about the internet. Really trippy when you think about it. I am going to use that from now on, “indulgent Googling.” It sounds so much nicer that what I usually say. And seriously crazy and scary about the internet. Welp! Oh well, it’s out there ;). Now these tofu fries!! I love love love what you do with tofu. You have given me the tastiest and most creative tofu dinners, and I’m so thankful for all of them. I already know this will be a future go-to. So I never knew I wanted tofu fries and now I sooo want them! I didn’t even think you could do this with tofu- amazing! nice idea !btw is the rabbit like a chopping board ?is it a glasswork? looks so cute! These. Fries. Look. Totally. AMAZING!!!!!!! I am so putting these on my meal plan for next week. The internet is so crazy, isn’t it?! Part of me wishes iPhones had been a thing when I was a baby, so that I could have cute videos of me learning to walk & talk. But, at the same time, I can’t help but wonder… how much is too much? And what a yummy recipe!! I love tofu (something no one in my family understands…..) and MUST try these. I am still in love with your potato starch covered tofu sticks with the honey and sriracha sauce. It is a favorite in my family. Will definitely give these a try as well. BUT, I have found the softer silken tofu explodes in the hot oil and I can never dry them enough to prevent this. I have finally found a very firm, drier variety that solves this, and we have been very happy with the results.